It’s been over a decade since the West was introduced to the Ace Attorney series and its loveable lawyer Phoenix Wright. 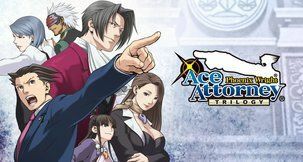 If you’ve never played a game in the franchise, it’s a series known for its mishmash of visual novel, adventure game, courtroom drama, and farce. Very few franchises wear as many hats, let alone add an unreasonable amount of puns to the mix. 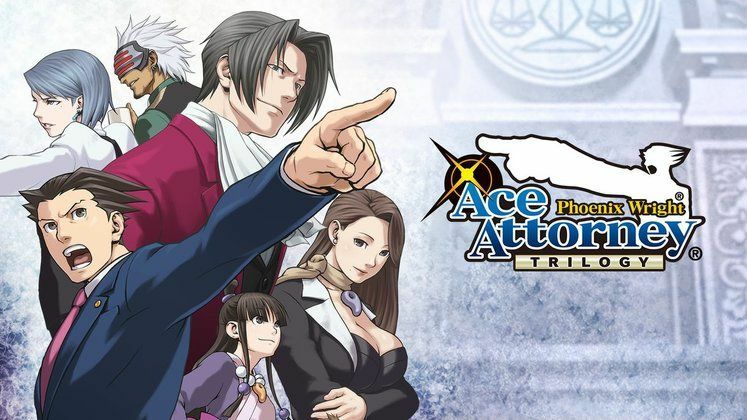 If you’re ready to deal with puzzles, over-the-top characterization and spiky hair, let’s talk about this rerelease of the first three games in Ace Attorney: Phoenix Wright: Ace Attorney, Justice for All, and Trials and Tribulations. 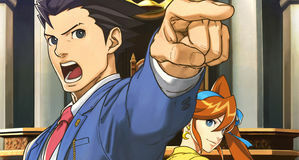 The Phoenix Wright: Ace Attorney Trilogy stars, to no-one’s surprise, Phoenix Wright. A rookie lawyer who solves mysteries with his spirit medium assistant, he throws his hat into the ring with a trust in his clients and a fighting spirit in the courtroom. It’s impossible to talk about the series without mentioning the likability of our protagonist. Even though his job involves fantastical cases, he is very relatable. He’s not flawless, frequently struggling against prosecutors with more experience under their belt. That’s what makes his victories special, even if you know how it’s going to end. In each of the trilogy’s fourteen episodes, you are introduced to a crime (almost always a murder) and are tasked with clearing the name of your client. There might be an overarching narrative for each game, but most episodes give closure that recent episodic games lack. It gives the best of both worlds: a long form narrative for each game alongside plenty of smaller stories. It’s formulaic as all hell, but it really works thanks to the heavy focus on character dynamics and absurdity. Caricatures are the name of the game here, and that’s not an insult. Most of the characters you meet that aren’t staples of the series will be one-note (two note at most) characters known for a pun worthy of your dad’s jokebook. 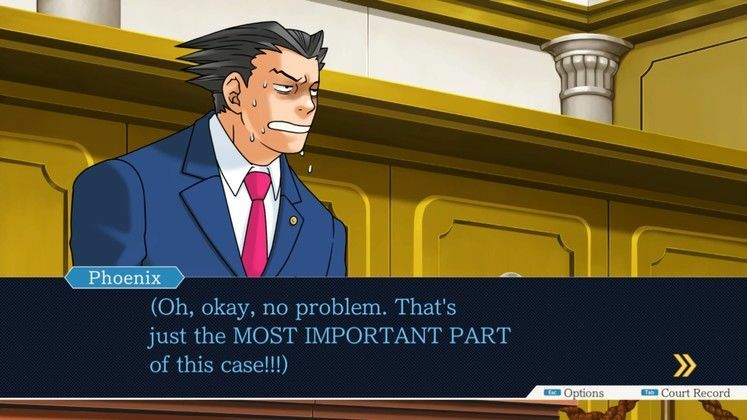 Adding that with the straight-man stylings of Phoenix Wright makes for some memorable moments.This is also true with the recurring characters. 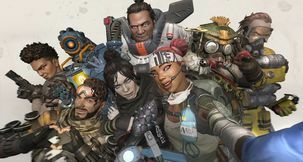 They are more fleshed out, albeit not to the point of complex, and the ways they bicker or get along is one of the major reasons you’ll want to keep playing. 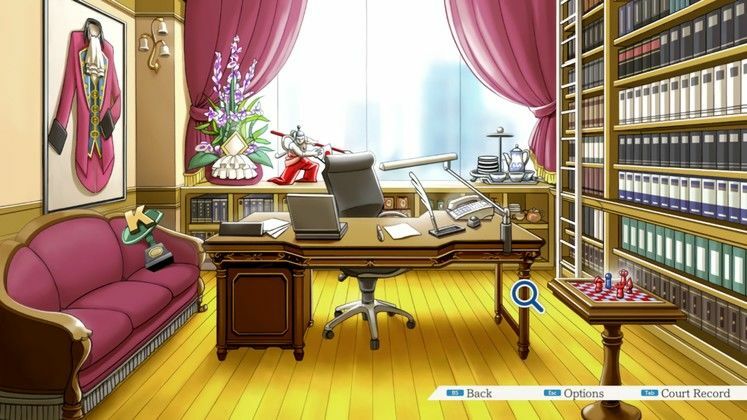 The best dynamics by far both involve Wright, specifically his relationships with assistant Maya Fey and prosecutor Miles Edgeworth. Seeing how these characters grow from their interactions is surprisingly sweet and it’s a joy to see how they evolve from game to game. However, some concurrent elements can be awkward at best and very problematic at worst. When Wright’s assistants channel a spirit, they take on a bustier appearance. Since the two assistants who do that are 17 and 8 respectively, it’s pretty gross and impossible to ignore. One notable case in the second game also involves a love triangle between a 16 year old and two grown men, and the upsetting implications aren’t properly explored. I’m not sure why ephebophilia is such a noticeable trope, but it detracts from an engaging experience. 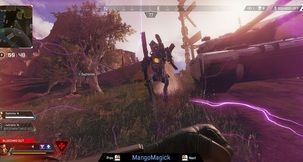 Each game splits into two separate styles. One side has you investigate crime scenes and collect evidence, while the other half has you actually doing your job as a lawyer in court. Investigations are rather straightforward as you talk to witnesses and solve basic puzzles. 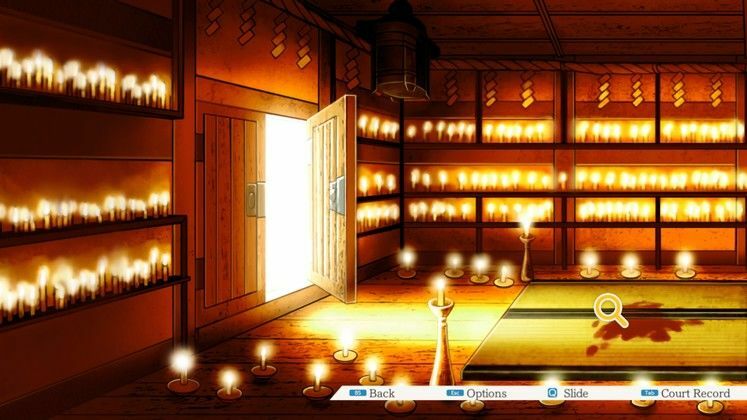 If you’ve played a point-and-click game, you’ll understand these parts well. This is pretty simple in the first game, but the later two titles add a bit more to the mix with the introduction of Psych-Locks: magical padlocks that hide the secrets of potential suspects. These unlock when you present them with the truth, and add a little variety to Justice for All and Trials and Tribulations. The investigation side, while not bad by any stretch of the word, is the weaker portion. 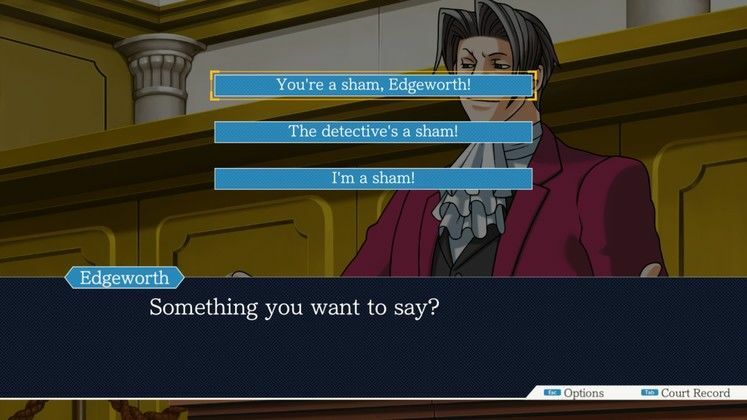 There are parts here where the game reaches a standstill unless you show a specific piece of evidence to a specific person, and that can fall into trial-and-error if you don’t get it the first time. This is where the game shows its age the most, and the part that makes you miss the quality-of-life improvements video games get later. Where the game shines mechanically is in the trial sections of the game. This is where you prove your worth as a lawyer and tear down the contradictions of the opposition. The majority of this regards finding a piece of evidence that goes against a witness’s testimony and promptly laying the smackdown. The moments you figure it out are always wonderful, the music cutting out to remind you that you’re correct. Even with how formulaic this series is, the tension that’s added with these puzzles and the sound design more than makes up for the obvious structure. It’s really good at making you feel smart when you solve a puzzle, and that’s difficult to design. Showing the wrong evidence or bothering a witness can damage your case and can lead in a game over, so it is important to figure out the problems in someone’s testimony before you present evidence. That’s a slap on the wrist though due to saves being readily available throughout most of the trilogy. Save scumming is very easy to do, and that’s a blessing and curse. On one hand, it makes the game accessible and possible to finish. On the other, it does form habits that will make you present all the evidence you have if you don’t know the solution. That choice is on the player though, so how you decide to solve a puzzle doesn’t ruin the experience. However, there’s one trial that will bother you to no end, and that’s the final trial of the first game: Rise from the Ashes. While its narrative has some really great moments and a gripping finale, it was originally made to showcase the Nintendo DS’s capabilities. The additional mechanics from this case are only for this case and don’t appear in the other two games. This includes finding blood samples, dusting for fingerprints, and looking at evidence in more detail. That might sound cool, especially with how polished the 3D models look compared to the original release, but the times you explore these mechanics in a meaningful way are infrequent. 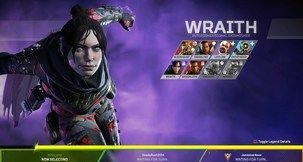 Add that with a control scheme that can feel sluggish, and it’s the weakest part of the game. The worst example involves you rotating a jar into a very specific angle. It’s not particularly fun, and the novelty wears out fast. While some trials are weaker than others, Rise from the Ashes is one that can discolor the whole trilogy if you’re unforgiving. 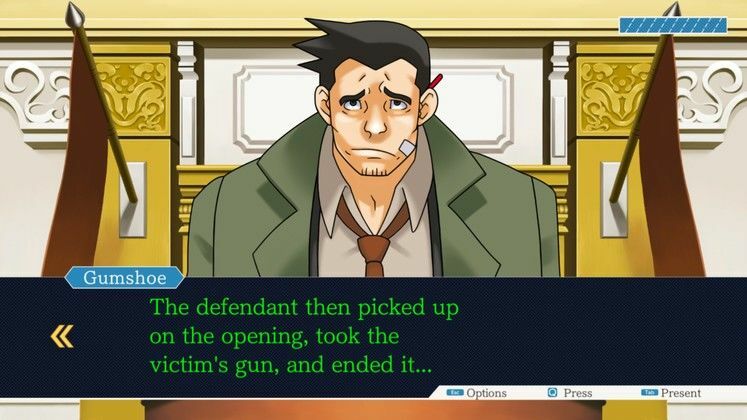 Apart from that egregious trial, the rest of the game is a blast if you’re a sucker for these types of stories. On the art side of things will be something polarizing for fans of the original. Rather than a radical change you might see in other rereleases, the new art feels traced. That alone isn’t bad, but it feels like the bare minimum. The exaggeration of the original game is still there, but players of the DS version will be left wanting more. 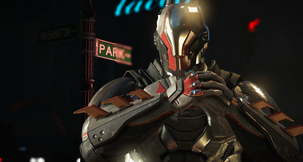 Newcomers won’t find anything wrong with the art and discussion regarding it can turn nitpicky. Even though playing the Phoenix Wright Trilogy in 2019 reminds you how times have changed for the better, it is still a worthwhile compilation. Fifteen years after Phoenix Wright was brought to the West, its charm and strong narrative are still as resonant as it was in 2004. If you still have the original trilogy somewhere, you don’t need to rebuy this unless you’re a fanatic. But if you’re someone who never played a game in the series and want to know what the fuss is about? This is well worth your time. It’s silly and some design choices can force the game to a crawl, but it’s very easy to persevere to see what happens next. Anytime “Cornered” plays as you figure out the true culprit. One of gaming's most endearing protagonists. Tons of character and heart. Fun stories with engaging twists and turns. Some problematic elements you can’t ignore alongside some outdated mechanics. Small buttons (if you’re playing with a mouse). Trial 1-5 is an absolute slog to play.